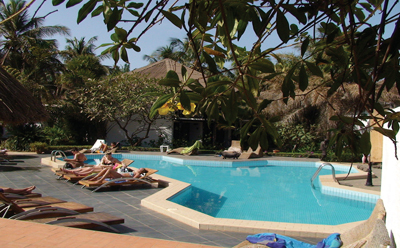 The quaint Bakotu Hotel is located near to Kotu beach and is an ideal location for discovering Gambia, both the people and the wildlife. The hotel is set in mature tropical gardens, accommodation is clean and the staff are warm and genuine and work hard to ensure guests enjoy their stay. The area is abundant with bird species and monkeys; the hotel even has a resident tortoise that can be seen chilling out! The atmosphere is quiet and relaxing, guests can chill out at the hotel pool to the sound of the birds, sunbath on the beach or enjoy the poolside bar. 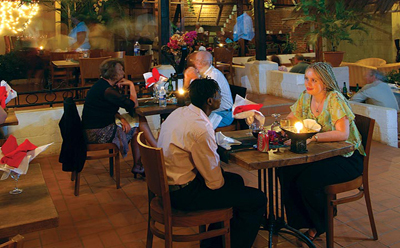 Being centrally located there are many local beach shacks offering food and drinks and two restaurants at the hotel all offering a variety of cuisine including traditional Gambian which is a must. The Captains Table restaurant at the hotel is popular with guests where you can dine under authentic grass roofs or eat alfresco while listening to traditional musicians, the menu offers many different organic dishes including beef and seafood sourced locally. The Bakotu Hotel is similar to Biyadhoo in the Maldives. It is a simple and friendly hotel that is brilliant for some people but not right for everyone. If you walked around looking for issues, you certainly find them but that is completely missing the point of the little gem. 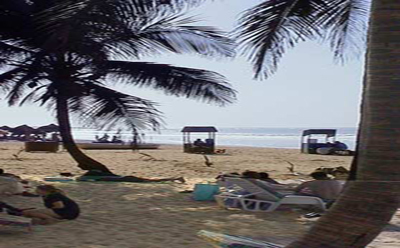 Bakotu Hotel is located 70 metres from the beach in Kotu. 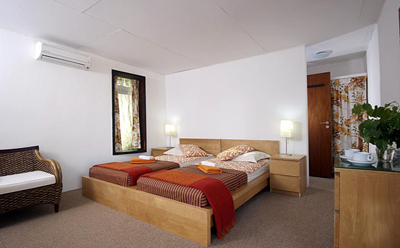 Bakotu Hotel has 90 rooms each with double or twin beds, a bathroom with shower, a fan or air-conditioning, and a fridge. If you have taken advantage of a special/discounted package these promotions may not necessarily apply & often offers may not be combinable. Offers may not be available through all operators. Please speak to one of our travel experts. For more information or to book, please contact the reservations team. Fill in any other details about your enquiry. By submitting your details, you agree to be added to our email database to receive our special offers via email. If you wish to opt out, please uncheck this box. 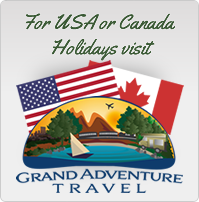 We have new holiday offers and special deals every week. Enter your details below to join our newsletter and receive these offers direct to your inbox.